Indeed an examination of the performance history of this role reveals few successes. American Carol Neblett achieved notoriety early in her career, not so much for the way she sang but for baring her bosom in the New Orleans Opera production, a very daring move in 1973, in a land that frowns upon "wardrobe malfunctions". Anna Moffo certainly looked believable enough as a courtesan, but the voice was in tatters when she recorded it for RCA. In the late 1970s, Beverly Sills had a qualified success at the Met in this role, mostly through the force of her personality rather than the quality of her singing, and she retired within a couple of years after singing this role. Occasionally you have less well known sopranos taking this on, such as Irish American Mary Dunleavy, who sang it quite respectably, in English, for Opera Theatre of St. Louis in 2003 opposite Canadian baritone James Westman as Athanael. Big-name Italian soprano Barbara Frittoli has just taken a stab at this role in Torino this season. While she is a beautiful woman, her voice with its wide vibrato is far from ideal and she pales in comparison to Renee Fleming, who has sung it to great success in Chicago, and has recorded it a few seasons back. 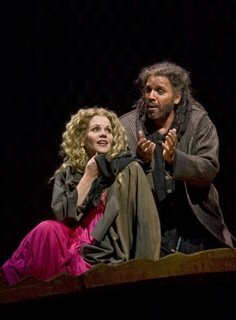 Renee Fleming has gone on record as saying Thais could have been written with her voice in mind. To my ears, her singing certainly does this role justice. Few sopranos, alive or dead, look as good as she does in closeup. She also has a tendency to throw herself into a role, acting up a storm - indeed sometimes her exaggerated acting and cloying mannerisms tend to distort and overwhelm her singing in roles like Tatyana and Desdemona. But as the coquette Thais, Fleming is near perfection. That said, I find her much more convincing in the pre-transformation, "material girl" phase of Thais, while she is much less convincing as the penitant, the once fallen woman now "saved" by Athanael. Her sweet smile and carefully struck poses in the death scene get high marks for glamour but scores very low in the spiritual depth department. This Met revival - first time in 30 years since Sills sang it in 1978 - uses the Chicago Lyric John Cox production with some modifications. If you are confused about the time period, you are not alone. The decor is vaguely Art Deco - I suppose you can argue that it is sort of neo-Egyptian - but why do the men wear tuxedos, of all things? They look like they've just wandered off the set of Die Fledermaus or Lustige Witwe. Fleming gets to show off her now ultra-slim figure in a series of form-fitting Christian Lacroix gowns. They are undeniably gorgeous, especially the frocks in Acts 1 and 2. But in her death scene, instead of a nun's habit, she is wearing an equally tight-fitting grey pleated number - in a convent? Thais, now a penitant, dies sitting up in a throne, with a smile on her face. I suppose in diva vehicles like Thais, dramatic verisimilitude takes a backseat to the necessity of making the prima donna look good. As Athanael, American baritone Thomas Hampson was in the best voice I have heard him in some time. He sang with firm, rich tone and admirable legato, only in forte passages did he sound a little pressed. Canadian tenor Michael Schade did well in the thankless role of Nicias, coping well with the tricky tessitura, although his tone has become increasingly hard-edged. Alain Vernhes contributed a characterful Palemon. Spanish conductor Jesus Lopez-Cobos gave a fluent and suave reading of the perfumy score, and I would be remiss not to mention the resplendent playing of the violin solo "Meditation" by Met concertmaster David Chan. This tune is recycled over and over again throughout the second half, but with such lovely playing, who can complain. There you have it - this production of Thais is a feast for diva worshippers, but don't take Massenet's fake religiosity too seriously or you will be disappointed - reserve that for Parsifal.